A high court in Abuja has asked the police to present its reason for detaining Senator Dino Melaye - The presiding judge, Justice Yusuf Halilu, gave the order on Thursday, January 17, after Melaye's lawyer complained of his client's prolonged stay in police custody - Halilu explained that the police was put on notice to come and show cause why the detained senator should not be granted bail. An Abuja high court sitting in Maitama on Thursday, January 17, ordered the police to show cause over its continued detention of Senator Dino Melaye. Melaye, the senator representing Kogi west in the National Assembly, who has been in police custody since Friday, January 4, approached the court for enforcement of his fundamental right, the News Agency of Nigeria (NAN) reports. Justice Yusuf Halilu gave the order after Melaye's counsel, Chief Mike Ozekhome (SAN), informed the court that his client has been in police custody since January 4, against what the law stipulated. "We are talking about the liberty of a citizen not because he is a senator of the Federal Republic of Nigeria, but a citizen, this is contrary to sections 35 and 36 of the Constitution of Nigeria. "If you keep a man for 13 days you have already presumed him guilty," he submitted. Simon Lough, the respondent counsel, told the court that he only got the motion on notice on Wednesday, January 16, and needed five days according to law to reply. He added that he was not aware of the order to show cause. He said though Melaye was in the police custody, he as the counsel does not have the power to effect his investigation which was ongoing, preparatory to charging him to court. Lough therefore prayed the court for an adjournment to enable him file and serve his reply before Friday, January 18. The judge explained that the police was put on notice to come and show cause why the detained senator should not be granted bail. "The court was approached by the police for his custody and the court granted it, and now the court ordered that the police should come and explain why he would not be released. I granted an order on Jan. 14, that the police should come and show cause,'' the judge said. He, however, adjourned hearing till Friday, to enable the respondent file his reply on the applicant. Both parties agreed to the application for adjournment prayed by the respondent. The judge further ordered the respondent to serve the applicant all the processes on Thursday. Earlier, Legit.ng reported that some masked police officers reportedly stormed the hospital where Melaye was recuperating, carried him into an unmarked vehicle and whisked him off. According to a witness, the officers forced the lawmaker, who was on the hospital bed, into an unmarked vehicle and drove him away on Friday, January 11. 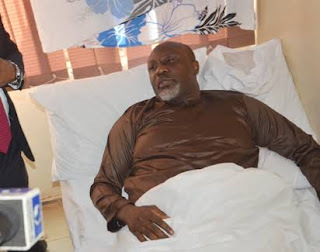 The police has however released a statement to announce that Senator Melaye was moved from the Police Clinic in Area 1, Garki, Abuja to one of the medical facilities of Department of State Service (DSS).